Topmost in my mind right now is not books. My thoughts and concerns are with Texas and the other areas of the Gulf Coast that are being pounded by rain and facing rising water. Please stay safe, help your neighbors, and remember that you and your family are more important than your things. Know that those of us in the north are thinking of you and are finding ways to help. If you want to find a legitimate way to aid the hurricane victims, be sure to check out a reliable source. It's horrible, but scammers come out during crises. I know CNN is vetting organizations, as is USA Today, Huffington Post, and the Weather Channel. Visit their websites for information on ways to get involved. 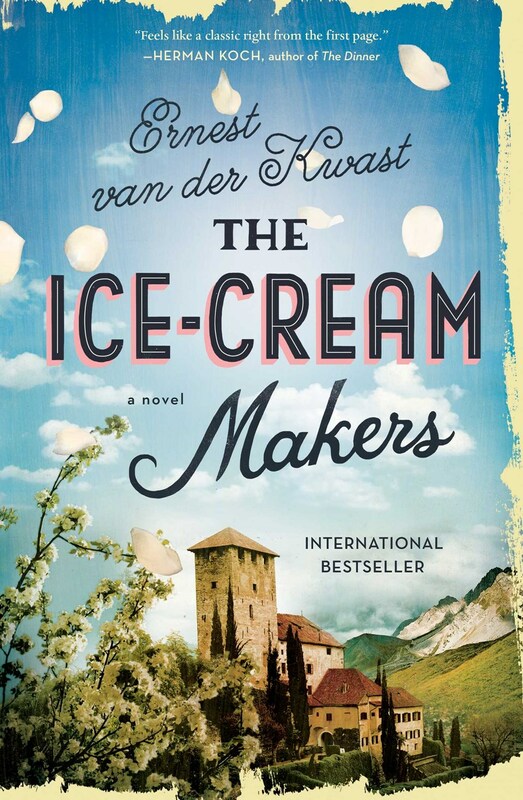 The Ice-Cream Makers by Earnest van der Kwast (37Ink, Aug. 1): I couldn't resist this novel about a family of ice cream makers who spends the winter in their native Italy and the summer in the Netherlands. Four generations of men give their lives over to the ice cream machine, all that is except Giovanni, who instead hears the call of poetry. When his father begins to slip into dementia and his brother asks for a huge favor, Giovanni must choose the path of his future. I generally love family sagas and novels that have a strong food element, but The Ice-Cream Makers was only okay for me. The writing was fine, but I didn't connect strongly to the story, which had more of a melancholy or bittersweet feel to it than the promised charm and quirkiness. You might like it better than I did. The unabridged audiobook (Simon & Schuster audio; 9 hr, 1 min) was read by Jacques Roy, who handled the variety of needed accents believably and ably distinguished among the characters. His fine performance kept me listening (I would have likely abandoned the print), but he didn't turn the book into a winner. 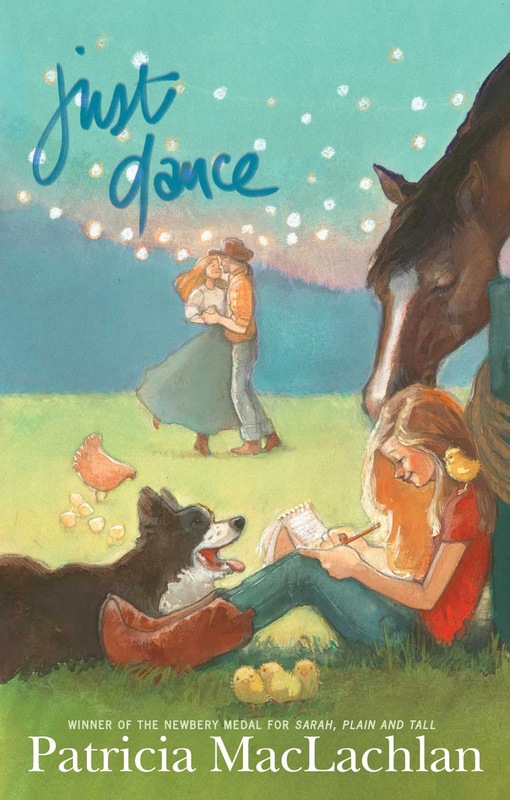 Just Dance by Patricia MacLachlan (Margaret K. McElderry Books, Sept. 12): Sylvia loves to write poetry and is thrilled when she's given the chance to write a kind of "out and about" column for her local newspaper over the summer before she starts fifth grade. Because she lives on a Wyoming farm outside of a very small town, Sylvia is sure she won't have much to report and won't find any surprises. But before the summer is over, she has made a new friend, learned how to appreciate the world around her, and even sees her mother--once a famous opera singer--in a new light. This is a sweet middle grade story that will delight readers of all ages. I loved the themes of the importance of family and how easy it is to bring joy to others. I also liked the reminder that there is always something new discover, even in a familiar place. If you enjoy middle grade stories or have an elementary school reader in your life, don't hesitate to give Just Dance a chance. It comes out next month. 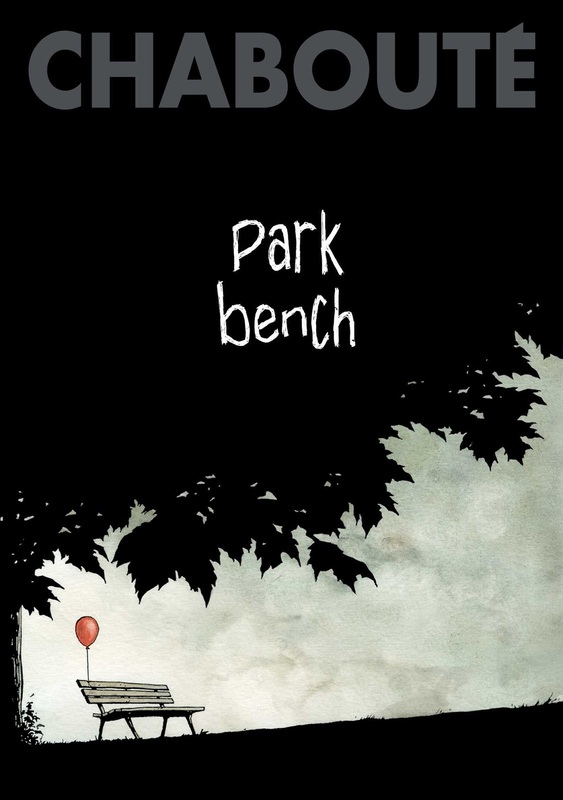 Park Bench by Christophe Chabouté (Gallery Books, Sept. 19): I was surprised by how taken in I was by this black and white graphic novel (comic) with no dialogue. I loved this look at life from the perspective of a park bench. The story takes place over several years, during which we see snapshots of a group of individuals: some hurry by, some stop at the bench to rest or read, one homeless man likes to sleep on the bench. Through the expressive, simple drawings, we see some of the people grow and change: a pregnancy, a death, a retirement. The ending even has a little surprise. This is a comic I know I'm going to "read" again. The first time through I was interested in the overall story line, but now I want to follow specific characters more closely to see how each relates to the bench. Did I really catch every panel featuring a man who seems to be thwarted in love? What about those older women who sometimes stop to chat? Look for Park Bench next month. 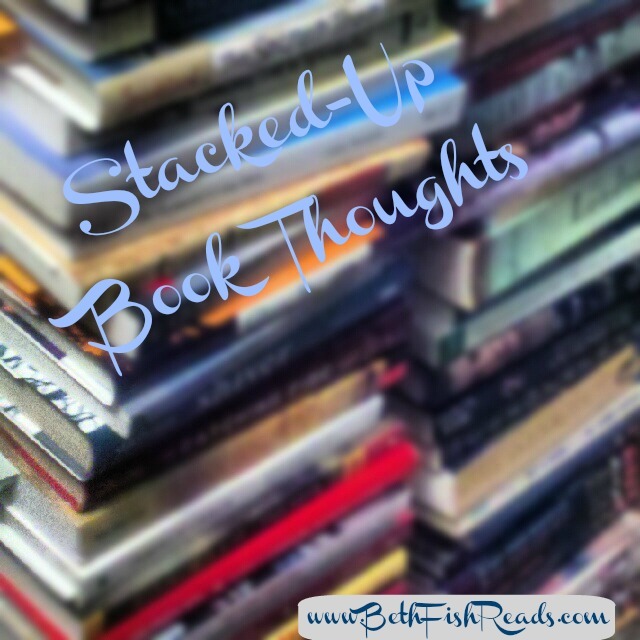 I'm stalled in Quicksand by Malin Persson Giolit for no particular reason than I put it down and never seemed to pick it back up. I may return to it again, but the first several chapters didn't advance me into the story, so maybe I'll just let it go. 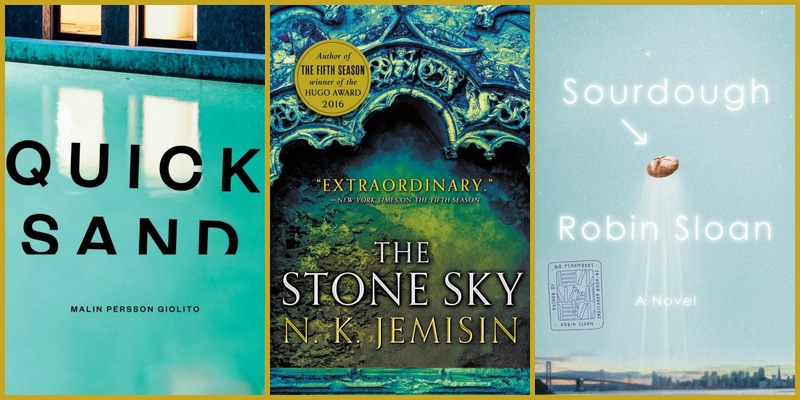 I'm currently listening to The Stone Sky by N. K. Jemisin, the third book in her Broken Earth series. I love the characters and the universe and Robin Miles does a brilliant job with the narration. I finished the audiobook of Sourdough by Robin Sloan, which was read by Therese Plummer. It's a light story that takes place in the Bay Area and involves a non-cooking robot programmer who is given a special sourdough starter, which changes her life forever. Plummer's performance is a good match to the novel and characters. I'll be reviewing this for AudioFile magazine soon. I really need to read Jemisin. I have heard nothing but good things about her books. I've got Sourdough coming up next - looking forward to it! Park Bench sounds very interesting as I pass by so many of them in Central Park. What an intriguing concept! Just Dance and The Stone Sky look intriguing. I hope you enjoy your books! Park Bench sounds different, I hope to get a copy. All of us in the Houston area appreciate your thoughts and prayers. I am curious about The Ice Cream Makers (love ice cream!). I've been watching all the reports from Texas and it's all so horrible. Definitely keeping all of them in my prayers. 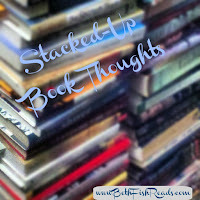 Your books all look interesting. I hope you enjoy them. I have been watching the television reporting of the storm on the Gulf Coast and praying for all the people. What a terrible event! 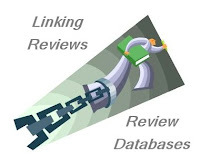 You read some books that sounded interesting to me. Come see my week here. Happy reading! There are many ways to help, but if you are looking to help Texas libraries recover from this catastrophe check out http://www.txla.org/news/2017/08/disaster-relief-and-support-for-libraries which is coordinated by the Texas Library Association. I'm adding the Park Bench to my wishlist. Thanks for stopping by. All new to me. Enjoy them all and have a good week. 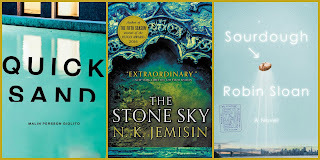 i am putting the stone sky on my tbl list .. loved the first two .. thanks! That was great that you mentioned what was going on in Texas and to keep them in your thoughts. We have a niece northeast of Houston and they are cut off, the roads are flooded and they are down to rationing food. I can't imagine being in such a situation. Good books here - I'd like to try the Ice Cream maker. Ooooh, I'll bet Jemisin on audio is stunning! I have the second book from the Inheritance trilogy calling to me from my e-reader, and I can't wait to start Broken Earth!